When I started reading this book, I found it supremely boring (no don’t kill me yet, hold your horses), and it was a struggle to keep at it. In fact, I would have certainly DNFed it, if not for the fact that I was buddy-reading this book with Bookish Muggle, and I really did not want to let her down. It’s the only reason I bothered to drag myself through the initial few chapters. And no, I am not saying it was all dreary, there were certainly sparks of excellence, but for the most part I was bored out of my mind. So from that kind of a beginning to now, when I’ve finished the book, and I’m obsessed with it – it’s clearly been quite a turnaround, and now I can’t imagine giving this anything less than 5 glorious stars. Sure, most of this has to do with a terrific second half, but in hindsight, I can see how the first half was as vital as the second to this wonderful wonderful story. Without the backstory, the second half wouldn’t have had the kind of impact it did. This one truly is a masterpiece, but I’m getting ahead of myself, so let’s back up a bit here. I know many people view this as an epic romance, a timeless love-story, and while it’s definitely one way of looking at it, I view this more as a ‘life story’. The tale of the evolution of a strong and independent female protagonist, a 19th century feminist, who was light years ahead of her time. The author utilizes the first person narrative, which creates a high degree of intimacy with the character; it made me feel like I knew Jane as well as she comes to know her own self. And the more I knew her, the more I liked her. I am not saying I agreed with everything that she thought or did. For instance, she sure had a strong moral compass, which is great, but was a little too preachy at times. And no, I am not judging her for that, just saying. At any rate, none of us can claim perfection, so I can hardly expect that from her. Having said that, I do envy her strength of character in the face of tragedy and temptation. Laws and principles are not for the times when there is no temptation: they are for such moments as this, when body and soul rise in mutiny against their rigour; stringent are they; inviolate they shall be. If at my individual convenience I might break them, what would be their worth? She did not to let love justify all the mistakes and wrong choices, and refused to let it blind her to everything else that was important for her sense of self-worth. And I LOVED her for this unwavering determination to stay true to herself! I wish I could have declared with any degree of confidence that I would have acted in a similar manner too, but in all honesty, I cannot say that. Which is why I found her to be a very brave soul, to deny the first glimpse of happiness that she found in her life, which had so far essentially been one long tale of woe. Also, as the book progresses, the plot movements bring her back to the place where she had spent her childhood, a place she had grown away from – mentally and physically. And it was at that time, that we can see the stark contrast in her personality, from the spit-fire she used to be, to the composed, self assured, lady she had turned into. It’s rare that we get to see that kind of evolution, and it was very gratifying to witness it. The book takes a very nuanced view of religion: there are the garden variety of hypocrites. The ones who use religion as a tool, or an excuse for what they do, to justify their own selfish end. There are the saintly characters who always turn the other cheek. And then there are believers like Jane, who are imperfect, but are doing the best they can. And while I clearly do not share the same moral or spiritual compass as Jane, her view of religion is the one I most relate to. Now speaking of the romance in this book, I must say that it was of a singular nature (book allusion, yes 😀 ). This is no Cinderella story. Jane is no hidden beauty, certainly not a damsel in distress, and Mr. Rochester is clearly no Prince Charming (far, far from it). Neither was this love story mostly a tale of attraction (though they are definitely attracted to each other). This one was a true meeting of the minds and hearts. A romance between two mature, strong willed people, who brought each other immense joy and fulfillment. A bond that makes a lasting impression on the reader. I also loved the repartee between Jane & Mr. Rochester. He made witty, sarcastic comments all the time, and she sassed him right back. Their banter always brought a smile to my face. And while we are still speaking of Mr. Rochester, I must mention this – when he first appeared, I found him extremely aggravating. He came across as a rude, bossy, entitled prick. I couldn’t fathom how anyone could even tolerate him, much less like him. And I know this story took place centuries ago, but I did not find that an acceptable excuse. For instance, even if we compared him with people around his time, like the arrogant, yet ever the gentleman, Mr Darcy, Mr. Rochester only seemed worse in comparison. But like the book, his is one character that made a complete turnaround. He went from aggravating, to tolerable, to adorable, pretty quickly. In-fact he is now on my list of favorite male leads! Who would’ve thought, right? 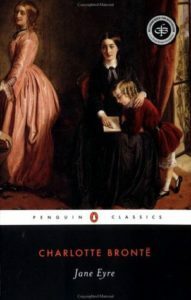 Jane Eyre is more than just an autobiography or a love story that transcends all boundaries; it is a testament to the power of pure emotion, that can be felt through the ages and across all barriers of time and culture. Needless to say, I highly recommend it. The Kindle Version is available for FREE over here. Or you can get the paperback version here. That’s all from my end folks. I would love to hear from you. Which book did you recently read? Also, have you ever been as obsessed with any book that you felt compelled to check out all the adaptations? Oh speaking of which, that is a post coming up soon – the various adaptations of Jane Eyre. Yep, I’ve got it pretty bad. I read the review at Bookish Muggle and I’ll say the same here. I read this one when I was really young and identified completely with Jane’s cause. Except perhaps that Mr Rochester kind of frightened me. He was so unlike other heroes – rude and bossy and so very ungentlemanly, a little too coarse. But he grew on me too, like you said. That last bit when she hears him calling out – that was the most perfect moment of love for me. Yes, that was adorable and so perfect that I had forbidden myself from trying to rationalize it. I just wanted to savour it. Ok so i think I am going to push myself to read this.. This has been lying in my kindle for months now and I have never been able to get past a few pages… BEing a classi the english is a bit heavy, i think it is this bit that literally put me off. The story line seems fine though and charecterisation seems interesting… Let me give it another shot. One thing that reminds me, after reading the first para of your review, is that all classics even old thrillers take a long time to set the story, but once you are past those first few chapters it is unlikely that you could leave them. It happened to me with Jane Austen as well as with Robert Ludlum and many more. Totally relate to your experience. I haven’t rad this one, but I think I’ll start on this soon. I am reading ‘Mistress’ by Anita Nair, on second chapter so far so good. Yep, that is indeed true of most classics, Ruchi. But this one, was among the more challenging ones to get through. Though I must say that it was equally rewarding as well. This is a really thorough review. I’ve always wanted to read this book but I’m honestly too lazy for it. I think I might start after reading this. Thank you, Tarang. And yes, this one is a struggle at the beginning, but it does pay off. Trust me, it does. But the struggle is for a lot more than 20 pages. Sigh. *scream* I am so glad you liked this book! My mum got it for me for a youngish birthday, and it’s been one of my favorite books ever since I was small. When I was a kid I thought Mr. Rochester was great, and uh, I have changed that to some extent. But I still love love love him and Jane together, and their banter remains among my favorite of all time. Oh yeah, even though he annoyed me at the beginning, Mr Rochester did grow on me. And I adored the chemistry and equation they shared. I haven’t read Jane Eyre and I doubt I will. Somehow I find the classics tad boring, especially their language. Kudos to you for sticking it out to the second half. These days I just drop a book if it does not engage me. Your review really makes me want to read this book. This one is worth the read, but you really have to be ready for it. Because it is a long one, and the language isn’t exactly easy to read. Having said that, don’t dismiss it right away, keep it on the radar. If and when you are able to get through it, I am sure you will love it. Hahaha..I can understand. Especially with your little one, time must be a challenge. And this book is no mean feat. Take your time. I look forward to hearing your thoughts. Aahhh..the adaptations post. Sigh. It got procrastinated thanks to the India trip. Will work on it soon. Kudos to you for writing such an extensive review of the classic, Shantala. I personally loved the book, I mean, who wouldn’t? One of the best books I have read in my lifetime. Thank you, Maliny. This one was indeed a wonderful read. It’s funny I never actually got around to reading this one, although I’ve heard of it described as one of the earliest works of feminist fiction. I’ve read Charlotte’s sister Emily Bronte’s Wuthering Heights and it happens to be one of my favourite classics. I’ve heard critics often pitted these two works against each other. Maybe one of these days I’ll pick it up, though I’ve more or less given up reading classics. Given up on classics? Why?